Many law firms support LGBT equality by donating money or doing cases pro bono. But one firm has taken it to a higher level—16 stories, to be exact. Nixon Peabody has donated 2,300 square feet of its 16th floor San Francisco office and partnered with StartOut, a nonprofit LGBT business accelerator, to launch the StartOut Growth Lab. The firm’s lawyers provide free legal advice and give critical information on business know-how to the seven LGBT-owned businesses they nurture. Tom Gaynor, managing partner of Nixon Peabody’s San Francisco office, came up with the idea. He said other law firms are not doing anything like it specifically for LGBT entrepreneurs. He’s a longtime volunteer on StartOut’s board of directors. His pitch to StartOut to partner on the project was simple: “I said, ‘I’ve got space and I’ve got a law firm whose DNA is fundamentally on the side of equality and diversity,’” he said. Gaynor, who has worked toward LGBT rights as an openly gay man for nearly 30 years, said the LGBT community has made great progress toward equality in politics, the law and civil society. But an impediment still exists to economic equality for LGBT entrepreneurs, who can’t find equal access to capital or business partners, he said. With the growth lab, Nixon Peabody hopes to help create a fair playing field for LGBT entrepreneurs who are creating technology products that could change the world. 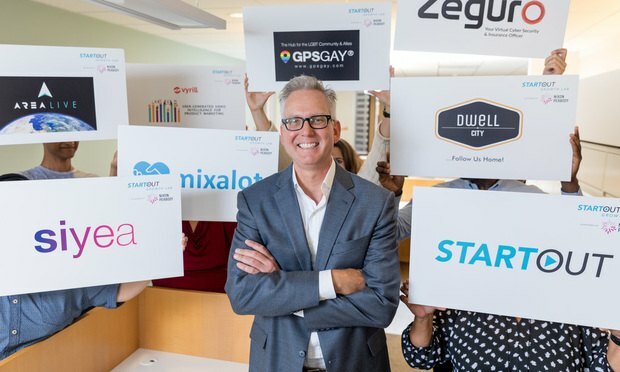 Seventy-five percent of LGBT entrepreneurs concentrate in the software, internet and media or consumer goods and recreation sectors, according to a 2016 StartOut research report. Although there’s no data to identify the number of LGBT entrepreneurs in the United States, StartOut executive director Andres Wydler said that his organization—a virtual accelerator providing mentoring, networking and more—counts 15,000 members nationwide. At the StartOut Growth Lab, businesses rotate in and out in six-month stints. The first group of seven businesses started in March, and they are all technology companies. There’s a social networking business, digital video marketing business, cybersecurity insurance startup, a company making software to enrich social events, an upscale housing rental and investment startup, an accounts receivable company and a so-called augmented reality startup. The augmented reality effort is the creation of Peter Sisson. His business, AreaLive, uses new technology that allows users to tag a video onto a physical location, and then other users can view the media through their smartphones or special glasses. Sisson said the value of Nixon Peabody’s lawyers’ input goes beyond legal advice. Using their business expertise, they can chime in on fundraising topics, connect the entrepreneurs with potential business partners and more, he said. “I was bowled over from the feedback we got,” Sisson said. He added that he wouldn’t hesitate to hire Nixon Peabody later when his business grows up. He’s been exposed to its expertise, met senior lawyers and gotten to know the firm’s culture. “I’m just like, ‘OK, these are people I would like to work with,’” Sisson said. Nixon Peabody’s San Francisco office has 70 lawyers, and Gaynor estimated that 80 percent of them have volunteered in the growth lab. A lawyer visits the lab each week to teach the entrepreneurs about various topics, depending on the lawyer’s expertise, such as marketability, financing, monetization, corporate law or employment issues. Entrepreneurs can call or email a lawyer any time with questions. The growth lab also is proving valuable to the lawyers who donate their time there. The StartOut Growth Lab is part of growing LGBT support from Big Law. This summer Fenwick & West, Morrison & Foerster and Sheppard, Mullin, Richter & Hampton marched in Pride Month celebrations around the country. Jenner & Block earned the top spot on The American Lawyer’s pro bono survey partly because of its commitment to LGBT rights cases. Gaynor and Wydler both said they’ve known of other law firms that donate money to LGBT nonprofits, which is always needed and welcome. The fact that Nixon Peabody was willing to sponsor the growth lab represents one of the reasons that Lu works there. Gaynor, who has worked in Big Law his whole life at firms such as Morrison & Foerster, Sidley Austin and Akin Gump Strauss Hauer & Feld, said he moved his practice to Nixon Peabody about two and a half years ago because of the firm’s commitment to diversity. Follow Angela Morris on Twitter: @AMorrisReports.